Last week I had the opportunity to meet face to face with a group of colleagues from around the world, after a period of working together as a virtual team. I had the privilege to share some ideas I learned in the past few years. During my preparation I noticed some interesting overlaps and touch-points between these ideas. 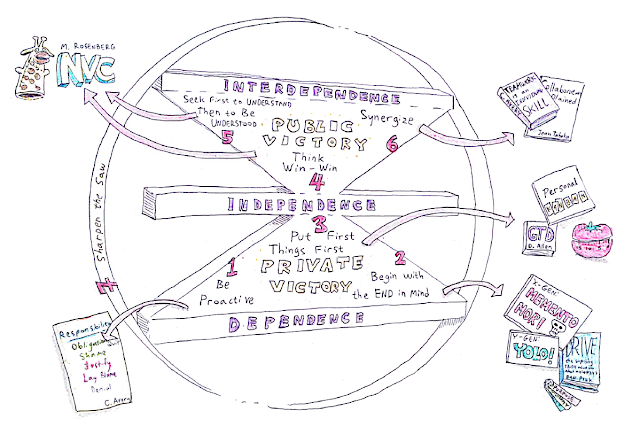 Here is a sketch these relationships between ideas, using Stephen Covey's 7 Habits wheel diagram as an underlying structure, while other books, concepts and disciplines as elaborate and enrich certain parts of it. The first habit is all about learning to choose your reactions overcoming automatic patterns of behaviors based on emotional triggers. I think Christopher Avery did a great job modeling our typical emotional transitions when we deal with problems with his "Responsibility Process". Covey's most morbid habit urges us to explicitly craft our own personal mission statement. We have one life, make it count. Well, having one life is sometimes used to justify some questionable actions (YOLO), but lets say the message is - make your life matter, don't waste it watching TV. Memento Mori rather than Carpe Diem. Having read "Drive" by Dan Pink, it seems there's a virtuous cycle at play - tuning to a purpose in what you do, kindles your intrinsic motivation, making you more engaged and therefore likely to succeed. Both relate to NonViolent Communication: seeking first to understand is all about emphatic listening, while thinking win-win could be thought of as aimed to address the needs of both parties assuming abundance rather than regard realty as a zero-sum-game (in which for me to win you'll just have to lose). This diagram and blog post is a result and a part of an ongoing, continuous search for new ideas and deeper understanding. I suppose this may be over simplistic, and based only on some of the things I personally encountered so far. How would you improve it? What are you missing here? Update: I started A post series introducing Covey's 7 Habits.